Preheat oven to 325°F. Line a baking sheet with parchment paper or set aside a baking stone. In the bowl of a stand mixer, combine flour, sugar, baking powder and salt. Cut in the cold butter in small, 1/4-inch cubes, and blend into the flour mixture. In a separate large bowl, combine cheese, egg, vanilla and lemon curd. Whisk until completely combined. Add dried, chopped fruit and almonds to the flour mixture and mix until completely combined. Add wet mixture to the flour mixture and mix until completely combined. Turn the dough out onto a floured surface and knead a few times until dough holds together. Divide in half. Roll out each piece of dough into an 8 x 7-inch oval, about a 1/2 inch thick. Fold each piece of dough lengthwise (or crosswise, up to you) leaving the edge of the top half about a 1/2 inch short of the bottom half’s edge. Lightly press the dough to seal about 1 inch in back of the open edge to get that traditional stollen shape (it’ll look kind of funky, like an off-kilter, misshapen loaf — this is normal. Do not panic.). 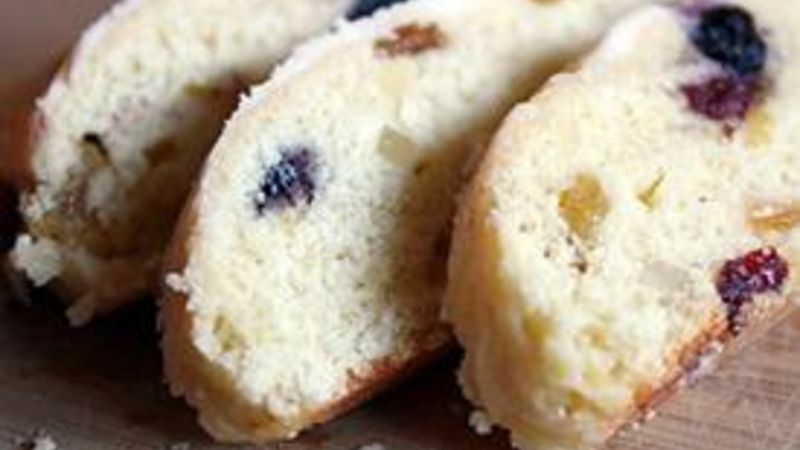 Place the stollen on prepared baking sheet and bake until lightly browned, about 30-40 minutes. A toothpick inserted in the center should come out clean. Transfer baked stollen to a wire cooling rack and brush each with about 2 tbsp of the melted butter reserved for the topping. Sprinkle generously with confectioners’ sugar. Allow the stollen to cool completely, then brush on the remaining melted butter and sprinkle again with confectioners’ sugar. Every holiday season, I get a serious case of baking lust. I want to bake 134 billion different kinds of cookies, cakes and breads. I want to make truffles. I want to make homemade candy canes. I want to buy a tree and bedazzle it with popcorn and cranberry-studded strings and sing “fahoo fores, dahoo dores!” like the Whos down in Whoville do. At least I think that’s what they’re singing. Alas, every year, I barely do any of it. I involuntarily become a real Scrooge, with nary a decoration and few a Christmas treat in my home. It’s a real “bah, humbug!” of a situation, I know, but I only have 24 hours in a day, and my fantasy Christmas schedule calls for at least 72. Sigh. But I always have time for Easiest Stollen. Because if it’s got sugar, I’ve got time for it. Last year, I made panettone, so this year I thought I’d keep with the tradition of holiday breads and baked this ah-maz-ing stollen. The husband was pretty happy about this one, as he grew up on the stuff. Soft, buttery and sweet (and I do mean buttery and sweet – there are layers and layers of butter and sugar atop the loaf), with colorful pieces of dried fruit inside that look like bright ornaments, it tastes like Christmas in bread form. For serious. This particular recipe is an easier, yeast-free version of the loaf – in other words, it’s the perfect recipe for us involuntary Scrooges who have only so much time these days to soak up the Christmas spirit. Not that I’m complaining – after all, no matter how crazy life gets, it still is the most wonderful time of the year. Stephanie (aka Girl Versus Dough) joined Tablespoon to share her adventures in the kitchen. Check out Stephanie’s Tablespoon member profile and keep checking back for her own personal recipes on Tablespoon!